The maintenance of a vehicle’s brakes is one of the most important elements in ensuring your safety and reliability on the road. Your well-being as well as that of the road users around you can rest on the performance of your vehicle’s brake system. For this reason we pay extra careful attention to the maintenance of your vehicle’s brakes. Because we understand the significance of this inspection, we offer a comprehensive check of your brakes completely free of charge. The check covers everything in your vehicle’s brake system from brake pads to shoes and discs. 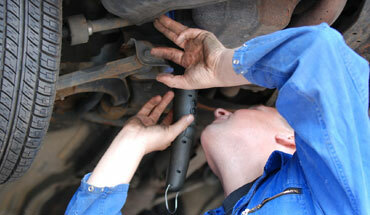 If there are any abnormalities then you will be informed immediately by our mechanics. To give an indication of just how important brake checks are you only have to look into the design of them. The process of braking (the rubbing together of two materials, the pad and brake calliper) causes friction and deceleration of the vehicle. This in turn leads to physical distress to both materials and a gradual wearing down of parts. Lubrication in the brake operating system can lead to brake failure, so inevitably the pads on your vehicle will wear down over time. There are various ways of noticing wear to your brake pads. One of the most obvious signs of wear is ‘brake dust’, tiny metal particles that have been broken off the brake pads as they are ground down. If there is no brake dust at all, then it may be a sign that you have completely worn down your brake pads all the way to the metal backing. Sometimes it is possible to tell if your brakes need replacing just by listening to them operate. A screeching noise is emitted when your pads are worn down to a certain point. This is a ‘wear indicator’ designed into the pads to audibly warn you that the pads need to be changed. If you can feel a grinding sensation as you brake then either your brake pads have been worn down or you have an alien object trapped in the mechanism. If the vehicle lurches to one side then it is likely that you have a problem with the hydraulics in the braking system. This could lead to uneven brake wear and should be corrected immediately. The heavier the vehicle, the faster the front brakes wear out. When checking your brake pads do not assume they are all in good condition by simply checking one rear wheel. It may be that the front has been worn down at a much faster rate. These are all signs that our mechanics and mechanics have been trained to spot but if you are able to distinguish an issue with your vehicle before you get to the garage then it will likely save you time and our team can get straight to the root of the problem. Accelerated pad wearing can be caused by actions such as ‘riding’ on the brakes or simply braking too aggressively and frequently. To save your brake pads, exercise good clutch control and plan your braking early, avoiding sharp deceleration. Many modern cars have been developed in a way that allows them to self-diagnose most internal faults. Most new cars that you see on the road have inbuilt computer systems which store information concerning the wellbeing of the vehicle. Using our specialist diagnostic equipment and knowledge we can analyse your vehicle’s fault codes and warning messages to help prevent accidents and breakages. We can run and assess the components and systems in your vehicle to establish whether it is running efficiently or whether any repairs should be initiated. The test can often point out problems with transmission, the vehicle’s oil tank, the petrol tank, exhaust system and many more vital components. Some modern vehicles are incredibly comprehensive and can log faults associated with the smallest systems such as the deployment of windscreen wipers. The information stored on your vehicle’s system allows our mechanics to identify problems straight away and can be one of the most direct approaches to spotting a fault. Subtle, minor problems that may have been missed without the development of on-board computers can be quickly spotted and fixed before they have the chance to escalate into much larger problems. We recommend a diagnostic check on an annual basis – it is an incredibly thorough procedure and can save you expensive repairs in the long term. When timed perfectly ignition occurs when the mixture of air and fuel in the cylinder is fully compressed. If ignition occurs just before or after compression then the engine can lose power. Any problems with the efficiency of the engine could be logged in your vehicle’s computer. Common problems include faulty wiring. This check will identify problem areas such as inefficient fuel lines. If there is a problem with your engine’s RPM, your vehicle’s computer will likely have logged a specific area for our mechanic to inspect. 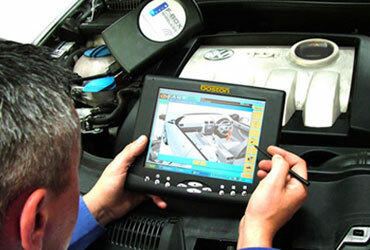 A malfunctioning fan or radiator could be discovered by running our diagnostics check. Problems such as a loose or damaged bearing could be stored on your car’s system as fault codes. By connecting with your vehicle’s computer, our mechanics can quickly check for problems such as the misalignment of the throttle position sensor. To conclude, running a diagnostics check is one of the quickest ways of getting our team of experts to the source of your vehicle’s problem. Whether you have noticed something is definitely wrong or you are simply worried that it has been a while since you last had your vehicle checked over, why not allow our team of experts run comprehensive checks for your peace of mind. Our highly qualified mechanics can inspect your entire exhaust system free of charge and can provide on the spot quotes if any repairs are advised. A fully functioning exhaust system is important for the general health and wellbeing of the driver and passengers of a vehicle; its primary purpose is to divert noxious and potentially harmful fumes away the vehicle’s occupants. At the same time, the fumes should not be harming pedestrians and other road users and so must reach health and environmental standards. Exhaust systems can also help to monitor the efficiency of your vehicle by calculating the amount of oxygen that is passing though and assessing the balance of the fuel/air mix being compressed and burnt in the engine. With such an important role it is very important that any faults are quickly identified and dealt with; with the average exhaust system consisting of so many components, you may find that frequent repairs are required. There are certain telltale signs of a malfunctioning exhaust system and one of the most obvious is a change in the noise that it emits. If you notice that your exhaust system has started to make a roaring noise then it may be that your silencer has been affected by acid damage. Sitting underneath your vehicle, the exhaust system is susceptible to water damage and corrosion. It will be fixed in place with a range of different bolts, brackets and fixings; if you start to hear a rattling then it may be that something vital has corroded away or become loose. A hissing noise could be cause by a crack in the exhaust system while a chugging could indicate that you have a blockage. If you hear any strange noise at all it is important to have a mechanic look at the exhaust system as soon as possible otherwise a manageable problem could manifest itself into complete failure of the exhaust system. but there are other more subtle indicators. One such sign is erratic engine revving while another can be increased fuel consumption. If you have any concerns about the general condition of your vehicle or have spotted a decline in its performance, then bring it in for a check and our mechanics can assess whether the state of your exhaust system has any part to play. If you have owned your vehicle for a long time or feel that your vehicle has covered a large mileage then it may be that your cambelt needs to be replaced. Our mechanics can calculate whether or not you need a new cambelt fitting by assessing the age and mileage of the vehicle. 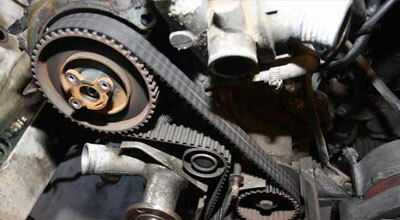 The cambelt, otherwise known as the timing belt, is one of the least known but most important components an engine. It is an essential part of keeping a vehicle running as it controls the camshafts within the engine. The combination of belt and camshaft allows combustion to occur, both letting air in and exhaust fumes out. I must be accurately calibrated in order to move in perfect time with the pistons. A broken cambelt can be devastating to a vehicle’s engine. If it breaks then there is a chance that a piston could easily be flung into an open valve, something that would convert a normally operating engine into a lump of unusable metal. Due to the sheer volume of variables that can influence the length of a cambelt’s lifespan there is no accurate indication of exactly when a belt should be changed, but it should be checked roughly every 10, 000 miles. The condition of a cambelt is not only affected by the distance that a vehicle has travelled, but also by hot climates, especially cold climates, rain and moisture, chemicals and even salt from the road. There can even be a difference between petrol and diesel-run vehicles. While there is no general rule of thumb for replacing cambelts, some manufacturers do offer advice on how often to change parts– it is essential that the belt is replaced when advised even if it appears visually to be intact. The fact that it is hard to deduct how long your vehicle’s cambelt will last makes it especially important that it is checked regularly. Just because your vehicle may have a low mileage does not mean that everything is operating perfectly under the hood. A few cracks on the exterior of the belt are acceptable but widespread wear indicates that the belt is nearing the end of its life span. Damaged teeth on the inside of the belt can be disastrous for your engine. Our mechanics will examine the belt to see if it has too much movement or play. If you think you may have a problem with your clutch or are unsure about what kind of condition it is in, then our mechanics can carry out a detailed assessment free of charge. If any repair or replacement is required we can also give you an free, on the spot quote. Clutch damage can be caused through frequent use, whether it be your driving habit (constantly ‘sitting on the clutch’ will reduce its life cycle) or even where you drive your vehicle. Driving in an urban environment can lead to the vehicle being stopped and started frequently which can wear down the clutch. There isn’t much of an increase of speed even when the vehicle’s revs are increasing. If you rev the engine and there is no notable change in speed then it could mean that there is a fault. Moving between gears is problematic. The engine revs rise and fall on their own. The high at which the clutch pedal engages has increased. A burning smell from under the hood could indicate faulty wiring, an oil leak or the clutch slipping. When the car is stationary, put it in second or third gear and release the clutch. If your vehicle doesn’t stall and the revs increase then a new clutch is required. One way of avoiding damage and increasing the lifetime is by minimising the time that you ‘ride’ the clutch. While waiting at traffic lights or when your vehicle is stationary it is good practice to have the clutch pedal pressed all the way down. This is because there is no wear to the clutch either at this point or when the pedal has been completely released. 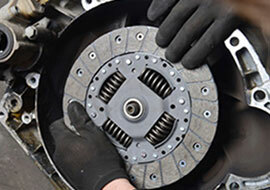 Damage to the clutch occurs when the clutch pedal is around the halfway point of compression. Some road users don’t even realise when they are using the clutch. A slight tap while braking can not only reduce the control that a driver has over the vehicle but can gradually wear it down.